Baby Broasca Eduard Andrei, eight months old, son of Romanian parents of Roma origins Niculai, 19 and Daniela, 15, was in April 2012 in the intensive care unit of the Marie Curie children’s hospital, in Bucharest, Romania. Andrei, who, against all odds, survived for eight months with almost no intestines, needed a transplant that costs hundreds of thousands dollars and could only be performed in the United States at his age. Doctor Catalin Cirstoveanu, responsible for this miracle, was fighting an exhausting and largely solitary battle against a culture of corruption and indifference toward patient welfare that’s deeply embedded in Romania. Last year, some 2,800 Romanian doctors, discouraged by the antiquated and corrupt health system and low wages left to work in Western Europe, according to the Council of Medics. 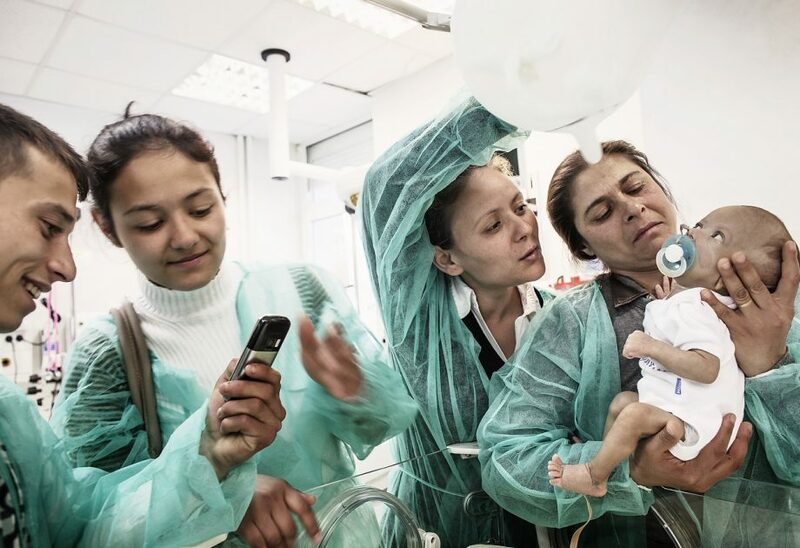 In April 2012, thanks to Vadim Ghirda, Associated Press Romania staff photographer, and his fellow colleagues there was hope for another miracle. Prior to their involvement no one knew or cared about this tragedy and the tremendous efforts made by dr. Catalin Carstoveanu to save the life of baby Andrei. Following AP visit to the hospital, the Romanian infant received offers of help to fund a complicated intestine transplant, in the U.S, according to the Romanian pediatrician who is in charge of caring for Andrei. The story of Andrei and of a doctor loved and respected by the whole nation, despite his modesty, received international coverage. As a result, the communist head of Romanian Council of Medics, a dodgy character investigated on corruption allegations, no later than last year, rushed to accuse the doctor for ‘carrying’ to much, thus demanding sanctions, and the photographer for not having a model release form signed by the parents. This is when I decided to step in and pay a visit to Andrei’s parents. I went to Tecuci and told the parents about the effort made by the doctor to save their son. It was a very touchy moment when they saw their baby for the firs time since birth on their computer screen. I told them about the photographer responsible for discovering and sharing this story with the world and I asked them to sign a model release form on behalf of Vadim. Yet, we still can spread the word about the only honest doctor in Romania. I live in a country where honesty and decency are considered a disease. We take pride in killing our heroes. It’s not because we envy them. It’s because they make us look bad. 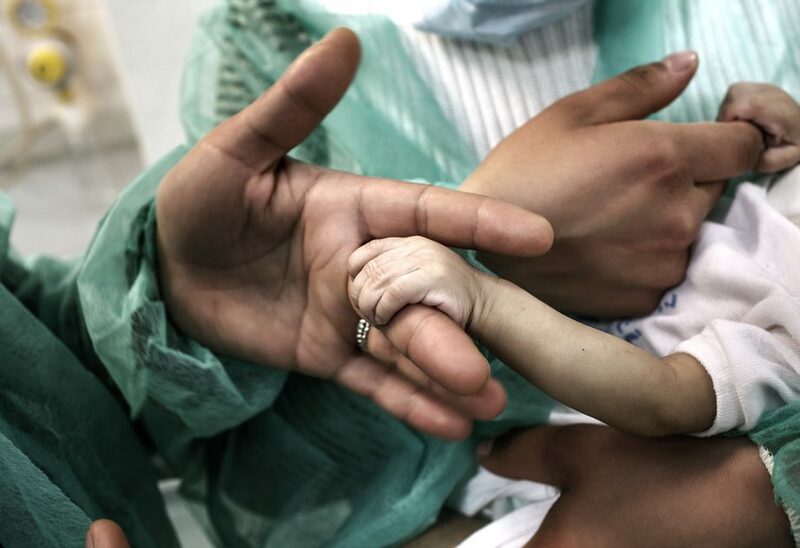 Baby Andrei, eight months old, son of Roma underage parents, visited by family for the first time since birth at the intensive care unit of the Marie Curie children’s hospital, on April 10, 2012, in Bucharest, Romania. Andrei, who, against all odds, survived for eight months with almost no intestines, needs a transplant that costs hundreds of thousands dollars and can only be performed in the United States at his age.